This is a updated fanny pack,it can satisfy all your requirements of waist pack while walking,running,hiking,cycling,travelling or working. ★This fanny bag has an invisible water bottle holder,when you don't want to carry water bottle,then you can fold the holder to be a normal and cool waist bag. ★The Ergonomic design to place water bottle horizontally can protect your belly safely when doing exercise.Meanwhile,this running bag is hard to bounce while running. ★And inner compartments in the pockets can protect phones or cards from being scratched by keys or coins. ★This waist pack is made of high quality Material,durable nylon fabric,abrasion resistant and water resistant for long lifetime. ★The thickened high elastic sponge in the back which can resist pressure and strengthen cushioning effect,you will love the breathable design. ★It has multiple reflective strips which can keep you running safely at night. ★MYCARBON bum bag is made of high quality SBS waterproof zipper. ★100% CUSTOMER SATISFACTION,please feel free to buy this travel bag. 3.Please don't wear it to swim or dive or in the heavy rain. 4.Generally recommend hand-wash,and please choose the ventilated place to dry the water bottle pack up. 【Updated Fanny Pack with Folded Water Bottle Holder】(THE WATER BOTTLE IS NOT INCLUDED) It is a lightweight cool fanny bag for running which can hold the water bottle invisibly and conveniently. This running bag for women and men was Ergonomic designed to place water bottle horizontally, can protect your belly safely and hard to bounce while running. 【Multifunctional Fanny Bag with Large Capacity pockets】Water bottle holder + 2 main pockets with Inner compartments + front pocket, enough space for your essentials like wallet , keys, cards, and big enough to hold phone up to 6'' such as iphone 6 plus,7 plus,8 plus,and good waist purse for travelling, hiking, camping, walking, running, cycling. 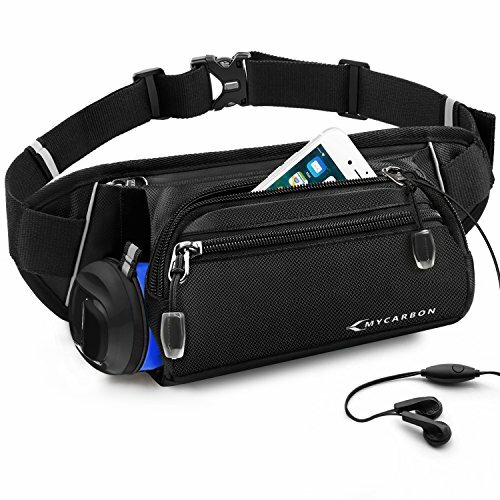 【High Quality Durable Waist Pack Bag】Made of high quality Nylon Fabric in the front, abrasion resistant and water resistant; The thickened high elastic sponge in the back can resist pressure, strengthen cushioning effect and breathable.Meanwhile,the inner compartments will protect phones or cards from scratching by keys or coins. 【Adjustable Running Belt with Multiple Reflective Strips】This hydration belt fits waist from 19.68in to 51.18in, because the high-quality Non-slip cotton belt is adjustable, and you can wear this waist pouch in front of your waist,back on your hip, slant across your chest or over you shoulder. And its multiple reflective strips keep you running safely at night, perfect as gifts. 【Waterproof Heavy Duty Zippers Hip bag for hiking】Zippers are the core of fanny pack, MYCARBON bum bag is made of high quality SBS waterproof zipper, but please don't soak it in the water, and don't wear this waist pack for women men while swimming or diving. 100% CUSTOMER SATISFACTION, please feel free to buy this wasit bag for travel. If you have any questions about this product by MYCARBON, contact us by completing and submitting the form below. If you are looking for a specif part number, please include it with your message.